Tracy wanted her fall wedding to full of rustic barn accents and glamour, but not the usual glitz and bling. 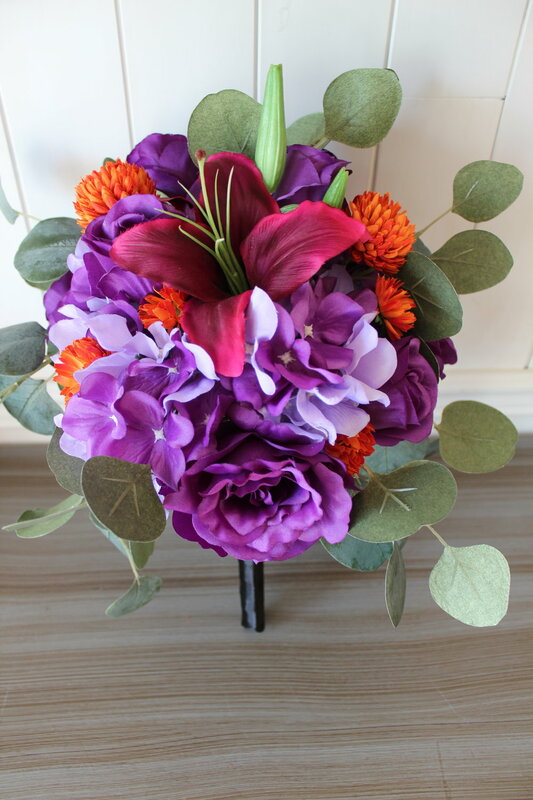 When she emailed me this spring about her wedding flowers, she painted a very vivid picture of their theme. I'll let her tell it in her own words.
" Just to give you a feel for the wedding, it will be in a renovated barn. But the theme is old time gangster meeting his sweetheart at a hideout because things were too hot back in the city." 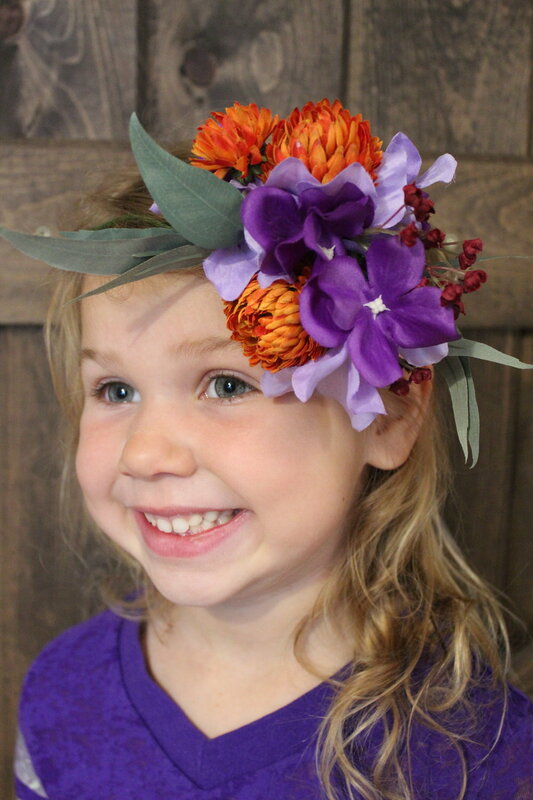 Tracy will be carrying a teardrop bouquet with burgundy Lilies, purple Roses, purple and lavender Hydrangea, orange Button Mums, and Silver Dollar Eucalyptus. Her three bridesmaids will carry a bouquet with matching flowers but in a loose round style bouquet with a single featured Lily. 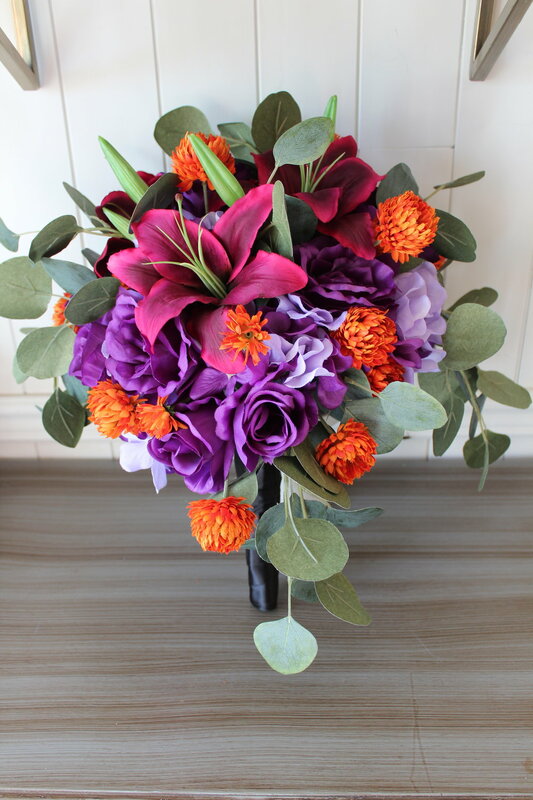 She had a couple of other arrangements she ordered that I crafted with the same flowers and that tie it all together. Not exactly a Pinterest-worthy setup, but shows off the beautiful cascade of flowers that will be added to their wedding cake. So what's your theme? Thriller inspired costumes, Disney fairy-tale ballroom, or maybe just a "hey, we love each other wedding"! Whatever your theme, there are silk wedding flowers to match. Send in your Free Bride's Checklist today to see what it will take to bring your vision to life.